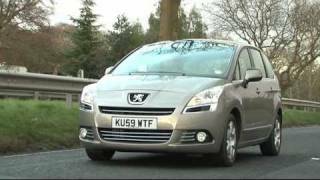 The Peugeot 5008, after the Peugeot 3008 crossover, is Peugeot�s second new product offering in the large M1 vehicle segment. This compact five to seven seater people carrier offers a number of significant benefits that will enhance and strengthen Peugeot�s presence in the family car market. 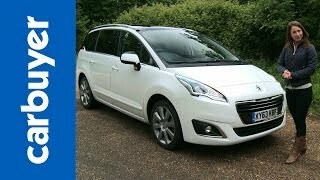 After the Peugeot 308 SW and the recent 3008 crossover, the Peugeot 5008, with a length of 4.53 m and a height of 1.64 m, is a natural extension to Peugeot�s current offerings in the M1 segment. Peugeot 5008 comes with a bright and very spacious interior. At the time of its launch, the Peugeot 5008 will be available with six latest-generation engines. Two petrol engines will be available at the time of launch: (1) 1.6 litre VTi 120 bhp BVM5 Euro 5 -7.3 litres/100 km and 169 g/km CO2 in the combined cycle (2) 1.6 litre VTi 156 bhp BVM5 Euro 5 -7.1 litres/100 km and 167 g/km CO2 in the combined cycle. Four diesel engines will be available: (1) 1.6 litre HDi FAP 110 bhp BVM6 - 5.4 litres/100 km and 143 g/km CO2 in the combined cycle (2) 1.6 litre HDi FAP 110 bhp BMP6 5.2 litres/100 km and 135 g/km CO2 in the combined cycle (3) 2.0 litre HDi FAP 150 bhp BVM6 Euro 5- 5.8 litres/100 km and 151 g/km CO2 in the combined cycle (4) 2.0 litre HDi FAP 163 bhp BVA6 Euro 5- 6.8 litres/100 km and 178 g/km CO2 in the combined cycle. With the Peugeot 5008, Peugeot has created a new interpretation of the compact people carrier. This new model combines all the manufacturer's key values but also builds further on the benefits expected by customers in this segment without any adverse effect on the vehicle's road holding. The Peugeot 5008 also introduces a range of cutting edge technologies to further enhance comfort, convenience and driving safety. As a result, the Peugeot 5008 aims to set new benchmarks in the market for compact people carriers. The Peugeot 5008, after the Peugeot 3008 crossover, is Peugeot's second new product offering in the large M1 vehicle segment. This compact five to seven seater people carrier offers a number of significant benefits that will enhance and strengthen Peugeot's presence in the family car market. 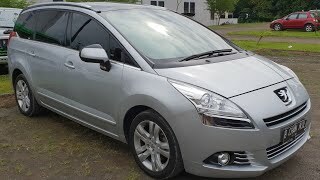 After the Peugeot 308 SW and the recent 3008 crossover, the Peugeot 5008, with a length of 4.53 m and a height of 1.64 m, is a natural extension to Peugeot's current offerings in the M1 segment. In terms of exterior style, the Peugeot 5008 stands out with its balanced and particularly distinctive profile. Its aerodynamic styling (Cx of 0.29 and Scx of 0.77) is akin to that of the TGV high-speed train. It evokes fluidity and driveability of the very highest order. The front of the car with its attractive profiled headlamps, steeply plunging bonnet which extends backwards towards the large front windscreen which is level with the front wheels, seems to be designed to penetrate through the air in the most efficient way. The natural fluidity emanating from the Peugeot 5008 is further enhanced by the chrome detailing decorating the front grille that gives the car an elegant and luxurious appeal. The design of the vehicle's sides both pure and smooth, create an impression of movement, while the high waist line inspires safety. The large glazed surface area seems to encircle the entire car without any interruption, a feature due in particular to the specific design of the large rear quarter panel windows which blend into the rear tailgate glass. This provides a bright and pleasant passenger compartment ambience for the benefit of all the occupants, not least the rear passengers who also receive the full benefit of the extra light provided by the large panoramic glass roof. The vehicle's profile reveals an elegant styling line which starts at the level of the rear door, becomes more accentuated on the wing and then passes around to the rear of the Peugeot 5008. This feature adds a further touch of dynamism to the side profile and gives character to the design of the tailgate of the 5008. The stylish design of the rear lights and their light-guide technology, give the car its visual signature. The impression created by the car's rear aspect is one of purity, robustness and status. The design of the tailgate hints at easy access to the boot, an essential quality for a family car. This new style is based on an original interpretation of a compact people carrier, where a dynamic exterior styling combines harmoniously with a large interior capacity. A luxurious interior designed for driving pleasure The driver's seat of the Peugeot 5008 is undeniably original and innovative in the world of the people carrier. The raised driving position typical of this segment gives the driver excellent visibility and a real feeling of safety. The designers of the car have succeeded in enhancing the ergonomics of the driving position, thanks firstly to the quality of the seats, and secondly to the steep vertical angle of inclination of the steering wheel, identical to that of the 308 hatchback. The driving position therefore provides the driver with good control and comfort, while at the same time retaining a raised position and the sense of dominating the road. Equipped with a number of avant-garde technologies such as a head-up display, and featuring high-quality, luxurious materials, the design of the driver's seat supports the theme of innovative and driving pleasure present in every detail of the Peugeot 5008. Focused around the needs of the driver, the instrument panel is further extended by the design of the elegant centre console with its flowing design. The inclined front of the fascia panel is designed to be in harmony with that of the dynamic exterior profile, creating an impressive feeling of overall space. The advanced ergonomics of the controls, all easily accessible, link the Peugeot 5008 to the range of Peugeot's range of current passenger vehicles. A bright and very spacious interior The area of the wide front windscreen (1.70 m²) is increased even further by the large panoramic glass roof (1.69 m²), one of the largest in the Peugeot range. As a result, passengers benefit from a bright interior and an exceptional panoramic view of the outside. Adding the side windows, the rear quarter panel windows and the rear windscreen, the glazed surface area totals 5.77 m². Spacious is certainly no understatement when it comes to describing the interior of the Peugeot 5008. For example, elbow width is 1476 mm at the front and 1520 mm in the second row, with its three individual seats of equal width. In the third row, where two adult passengers can be seated, this value is 1341 mm. Leg room is just as generous, as is headroom, which means that tall passengers can be accommodated without difficulty. For passengers wishing to optimise their seating position, the three seats in the second row are equipped with two seat back tilting positions and can slide individually over a length of 130 mm. With regards to modularity, this makes it possible to increase the capacity of the rear load area or provide slightly more space for the third row occupants. The modularity of the Peugeot 5008 is of the highest order within its segment. The second row comprises three seats of equal width, which can be adjusted lengthwise and feature reclining seat backs for optimal comfort. They can also be folded individually into the passenger compartment floor to form a perfectly flat surface perfectly aligned with the rear loading sill. Bearing in mind that the front passenger seat can also be folded flat into a "shelf configuration", it is therefore possible to load long objects as far as the fascia panel. The effective load length in this configuration (all seats folded away and the front passenger seat folded flat in the shelf position) is 2.76 m.
The 'cinema' positioning of the second row outer seats allows easy access to the occupants of the third row seats. In one easy movement, the seat cushion lifts and the seat back moves forward, freeing up the maximum space for those wishing to get into the car. This advanced modularity is also in evidence in the third row, where the two full size seats fold individually into the rear floor. The interior of the Peugeot 5008 therefore offers multiple possibilities in terms of layout, enabling it to meet the needs of all occupants in real style. The boot of the Peugeot 5008 is very practical and easy to use thanks to its rectangular shape. Depending on the position of the sliding rear seats, it offers a generous capacity, ranging from 758 litres to 823 litres (or 579 to 678 dm3 according to the VDA 210 standard) under the parcel shelf with the third row seats folded away. The boot of the Peugeot 5008 offers one of the best load volumes in the segment. This capacity increases to 1247 litres when the rear parcel shelf is removed and the vehicle is loaded to the roof and can further increase to 2506 litres with the second row seats folded away as well. For families who are always in search of extra space, particularly when going off on holiday, the numerous storage spaces on both sides of the passenger compartment can easily accommodate the different requirements of its passengers. At the front, particularly large door pockets supplement the space provided by the glove box, the storage area under the steering wheel, and the ingenious design of the 'ventilated' centre console with a capacity of 10.5 litres. Inside the latter it is possible to store all kinds of objects, in particular two half-litre bottles. Depending on the car's standard equipment levels, within the storage area an auxiliary connector (jack or USB), allows the connection and storage of a mobile music player well out of the sight of prying eyes. At the rear, passengers can use the storage areas in the floor as well as the rear door pockets, all of which are very accessible. Other storage spaces for sundry items are also available throughout the passenger compartment for the use of the driver and passengers, including those in the third row. Finally, 60 litres of storage space is available in the five seat version under the rear load area carpet, confirmation that every space has been exploited to the full to offer superb practicality in day to day use. Its vast interior, roomy and modular, is also particularly comfortable. All passengers will appreciate the comfort provided by all of the seats. For example, particular attention has been paid to the third row occupants of to ensure that they can enjoy a level of comfort, safety and space comparable to that of the other seats. For example, special storage spaces have been installed, while the large rear quarter panel windows can be equipped with retractable sun blinds (as in the second row). Occupants are also protected by the curtain air bag which extends rearwards as far as the third row. Finally, the vehicle's low exterior noise levels enable the occupants in the third row to converse easily with the front passengers without having to raise their voice. Because their seats are not directly in line with those in the front the third row occupants also benefit from an unrestricted forward vision, further confirmation that these are real seats and not additional seats for occasional use only. To make the journey as comfortable as possible, ventilation units, whose intensity can be adjusted by the second row passengers, provide air-conditioned air rearwards through air vents located in the side pillars. All seats therefore also benefit from a high level of thermal comfort. To make long journeys more enjoyable, the Peugeot 5008 offers second row passengers a multimedia system which is perfectly integrated into the passenger compartment. It consists of two 7" colour screens located in the front seat head restraints, a connection console to connect different types of mobile audio/video equipment (video console, games consoles, DVD player, etc) and two Bluetooth wireless headsets. This wireless technology is particularly efficient in terms of sound quality. It transmits the audio signal regardless of the position of the headset. A third headset can be purchased as an accessory and used simultaneously. It is also possible to connect two video sources simultaneously, making each screen independent in terms of the image being shown. Thus the rear passengers can choose to watch the same programme on both screens or enjoy two different activities. While one passenger plays a computer game for example, the other screen can show a cartoon, a film, video clips, etc. In short, everything has been designed to offer maximum comfort and convenience in a roomy passenger compartment offering a superb level of modularity. The Peugeot 5008 sets new standards in terms of safety and driving comfort with the introduction of new and innovative technologies into the compact people carrier segment. The Head-Up Display is a device borrowed from the cockpits of fighter aircraft! It provides essential driving information (speed, cruise control/speed limiter and distance alert) via a translucent panel which extends from the top of the instrument panel. The driver can then see this information as though it was being projected on to the windscreen, and therefore does not have to take his eyes from the road to stay informed. This equipment, innovative at this level of the market, offers real gains in terms of primary safety as well as driving convenience. The Distance Alert is a technology which helps the driver to comply with safe distance. A radar located behind the lower front bumper panel measures the time in seconds between the vehicle in front and then transmits this data to the head-up display. The alert system, which can be set between 0.9 s and 2.5 s by means of toggle switches located on the fascia panel, informs the driver if he is driving too close to the car in front. Since this equipment is non-intrusive, the driver remains in control of the vehicle at all times. This system, once again, is not usually found on this level vehicle. It also efficiently complements the speed limiter and cruise control in terms of safety. Snow Motion is an intelligent traction control system. It adds a further function to a traditional traction control system, allowing the driver to move off and make effective progress on icy or snow-covered roads. This original management of the ASR is activated automatically and is naturally even more efficient when combined with snow tyres. A head / curtain air bag covering all three rows of seats is available on seven seat versions. Operating with a single generator, it is activated at the same time as the side air bags to optimise the safety of occupants. All rows are therefore effectively protected. ESP fitted as standard, six air bags, automatic electric parking brake with 'hill assist' function, fasten seat belt warnings on all seats, tyre under-inflation detection, etc. The Peugeot 5008 benefits from a comprehensive range of safety equipment designed to enhance comfort, convenience and driveability. The Peugeot 5008 also aims to become a new benchmark in the compact people carrier segment in terms of driving enjoyment thanks to its exceptional road holding, worthy of the best Peugeot passenger cars, and its high-performance suspension. 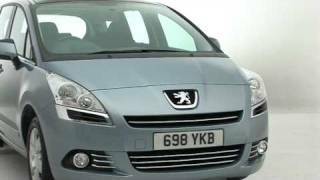 Development of the Peugeot 5008 suspension reflects all of Peugeot's know-how in this field. First of all, the exceptional body rigidity for this type of vehicle (0.69 mrad), not only enhances the car's exceptional road holding but also reduces vibrations. Next, the front suspension, a pseudo McPherson type assembly with a drop link anti-roll bar derived from the 308, a benchmark in terms of driving dynamics. The rear suspension with its rear torsion beam has been derived also from the Group's platform two vehicles, but is specially adapted for this type of vehicle. The Peugeot engineers have worked hard to give the Peugeot 5008 safe and efficient road holding comparable to that of a saloon car, whilst at the same time maintaining the high level of comfort and convenience expected by people carrier users. In addition to the fine-tuning of the car's suspension, tyres with a low rolling resistance have also been specially developed in 16" and 17" versions, while 18" tyres are available to devotees of more 'sporty' driving. Large brakes (302 mm for the most powerful versions) guarantee highly efficient braking, while directional control, one of Peugeot's key values, is assured by an electro-hydraulic pump unit. The results are exceptional and will be appreciated by all passengers, including those in the third row, who have been given the same consideration as the car's other occupants. This blend of comfort and road holding is one of the key character traits of the Peugeot 5008. At the time of its launch, the Peugeot 5008 will be available with six latest-generation engines. 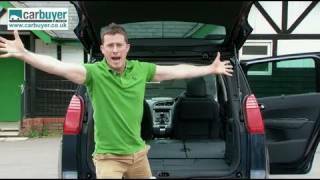 They will combine perfectly with the dynamic styling of this new people carrier. Combining performance and fuel economy, these engines also offer reduced levels of CO2 emissions together with great driveability. To facilitate driving on a daily basis, the Peugeot 5008 is also equipped with a range of useful technological equipment such as front and rear park assist and an innovative system which measures available parking space. This function, controlled by two sensors located on the sides of the front bumper, provides a visual indication on the multifunction display of the possibility of parking in a free space and the level of difficulty of the manoeuvre to be carried out. The Peugeot 5008 incorporates the very latest innovations in Peugeot's telematics range, called WIP (World In Peugeot). WIP Sound constitutes the basic offer and provides an MP3 compatible mono CD radio with a jack type auxiliary connector located in the central storage console. This system if required can be supplemented by a Bluetooth hands-free kit and a USB connection with the WIP Connect option. WIP Nav is the entry level system with its large 7", 16/9 retractable colour display perfectly integrated in the fascia panel. The cartography, including 30 European countries, is stored on an SD card and can be displayed in 'bird view' mode. This specification also offers a Bluetooth hands-free kit and an MP3 mono CD radio with auxiliary connector. WIP COM 3D, the top of the range offer, incorporates the very latest technologies in the field: a high-definition retractable 7" 16/9 colour display, 3D European cartography stored on a 30 GB hard disc, location for SD memory card, DVD player, USB and audio/video auxiliary connector, jukebox function, Bluetooth hands-free kit, etc. A GSM module with SIM card slot provides access not only to telephone functions but also to the reassuring Peugeot Emergency Service which alerts the emergency services in the event of an incident. Lastly, for hi-fi enthusiasts, a JBL HiFi option is available. This comprises six speakers, a 240 W amplifier and a bass cabinet, all perfectly integrated in the passenger compartment. The number 5 of the 5008 carries echoes of the manufacturer's past in the field of family vehicles, while the central double zero uses the designation specific to vehicles with a tall architecture and a raised driving position, extending the traditional Peugeot range. For its part, the 8 specifies the generation to which the new model belongs.